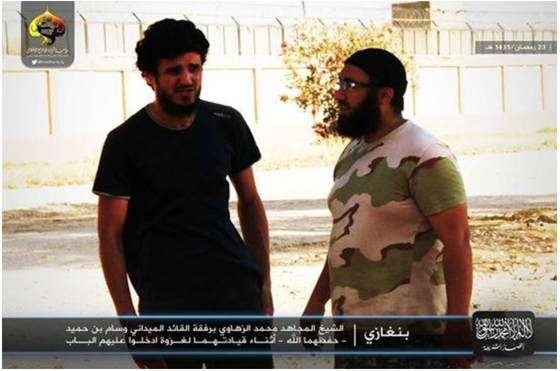 Wissam Bin Hamid chats with Mohammed al Zahawi in a photo that was posted online by Ansar al Sharia on July 22, 2014. A version of this article was first published at The Weekly Standard. A key figure in the security failures surrounding the Sept. 11, 2012 terrorist attack in Benghazi, Libya is fighting alongside members of Ansar al Sharia, which is one of the terrorist groups responsible for the assault on the US mission and annex that night. But in recent days Bin Hamid has been pictured with Ansar al Sharia’s leader, as well as the group’s fighters, in Benghazi. The pictures show Bin Hamid and Ansar al Sharia overrunning a Libyan special forces base and capturing a large amount of weaponry. 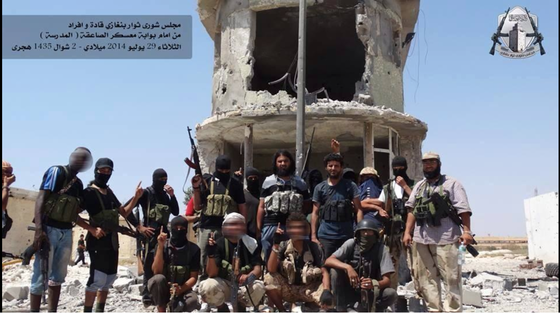 One of the pictures [shown above] was posted by Ansar al Sharia on its official Twitter feed on July 22. The accompanying text in the tweet reads, “The mujahid Sheikh Mohammed al Zahawi accompanied by the battlefield commander Wissam Bin Hamid – May Allah protect them both – during the course of their leadership of the invasion.” Mohammed al Zahawi is the head of Ansar al Sharia. Other pictures can be seen at the end of this article. A declassified State Department cable dated Sept. 11, 2012 recounts a meeting between Bin Hamid and American officials that took place just two days prior, on Sept. 9. Bin Hamid’s name is spelled “bin Ahmed” in the cable, which was released by the House Oversight Committee. “They wanted to know who was in control in Benghazi,” Bin Hamid recalled, according to the Post. “It was like an introductory meeting. They asked us what we needed to bring security to Benghazi, what the Americans could possibly bring to help.” According to Bin Hamid’s account, he told the Americans that Benghazi was comparatively safe. In its account of the Benghazi attack, The New York Times omitted key details and got other facts about the perpetrators wrong. Nonetheless, Bin Hamid was interviewed by the Times and his own testimony implicated him in the Libyan security forces’ failure to come to the Americans’ aid. Bin Hamid “received an urgent call from” a friend of Ambassador Christopher Stevens “asking for help” that night. Bin Hamid explained he “arrived at the scene within 30 minutes after the attack began,” according to the Times. However, he did nothing to intervene. “The situation wasn’t suitable for me to go inside the compound,” Bin Hamid said, according to the Times. ”And when the shooting stopped, we thought the Americans had been evacuated.” The Times reported that US embassy officials in Tripoli arranged for a security team to fly into Benghazi after the attack had begun. They were supposed to meet with Bin Hamid’s subordinate after they landed, but Bin Hamid himself showed up, as he was supposedly eager to assist the American team. Bin Hamid did nothing, that is, as members of several jihadist groups, including Ansar al Sharia and three other organizations that belong to al Qaeda’s international network, ransacked the American compound. A separate account in the Times also cites Bin Hamid. The Times reported that members of his militia “escorted intelligence officers and diplomats away from the besieged villas on September 11, and later, provided protection for American investigators visiting the city in search of evidence in the attack.” The Times also speculated that “it could fall to Mr. Hamid and his men to confront commanders of” Ansar al Sharia, which Bin Hamid said he wouldn’t do. 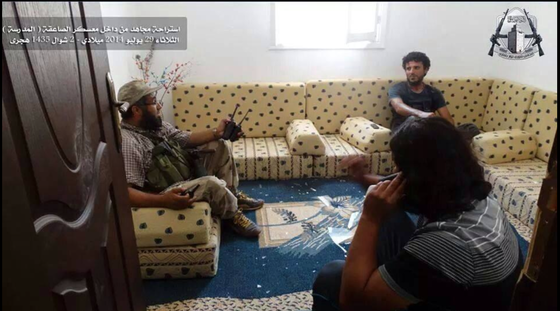 The newly released photos show Bin Hamid meeting in Benghazi with Ansar al Sharia’s leader, Mohammed Ali al Zahawi, and leading the jihadist forces that seized a Libyan special forces compound. The Libyan army forces stationed at the base were aligned with General Khalifa Haftar, a rogue commander who launched “Operation Dignity” in May to combat the militants in Benghazi. Ansar al Sharia is operating under the umbrella of a coalition of militias called the “Benghazi Revolutionaries Shura Council,” which is opposed to Haftar. While the Libyan government and its American counterparts in the country were reportedly willing to work with Bin Hamid prior to the Sept. 11, 2012, attack, some US counterterrorism analysts suspected that he was already a part of al Qaeda’s clandestine network in Libya. The report provides little tangible evidence connecting Bin Hamid to al Qaeda’s network, but such ties were still suspected. 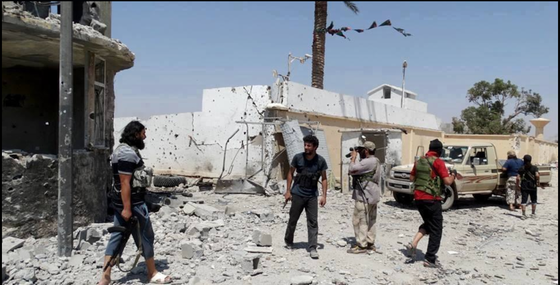 The authors noted that Bin Hamid’s brigade fought “under al Qaeda’s flag” and referenced an article in a Palestinian newspaper that reported on a video of “an al Qaeda-type demonstration” in the city of Sirte. The article “pointed at” Bin Hamid as the “leader of al Qaeda in Libya” and said that Mokhtar Belmokhtar, a notorious al Qaeda commander who has his own reported ties to the Benghazi attack, “attended the parade” as Bin Hamid’s “honored guest.” This allegation has not been independently verified, and it appears that the original article is no longer available online. The report’s authors doubted that Bin Hamid was truly the head of al Qaeda’s presence in Libya given his high profile in the media and al Qaeda’s “penchant for secrecy.” Still, a graphic included in the report portrayed Bin Hamid and his brigade as a part of al Qaeda’s plan for Libya. And the report described Bin Hamid as “a young rebel leader who allegedly fought in Iraq,” which, if true, indicates he may have fought for al Qaeda in Iraq. While much of Bin Hamid’s past remains shrouded in mystery, his present activities are plain to see. Ansar al Sharia is advertising its working relationship with Bin Hamid in pictures posted online. The pictures below were first posted online at twitter.com/Morning_LY. How long is the US going to put up with Bin Hamid? Has the United States totally lost influence in Libya? This situation is rapidly spinning out of control. Niger to Syria spinning in, Egypt in the middle hanging on. Sharia has an amazing pull on these young men.